NEW YORK (CelebrityAccess MediaWire) — In response to seemingly overwhelming demand, Dispatch has added a third night to "Dispatch: Zimbabwe," a benefit concert being held at Madison Square Garden. Originally created as a one-night event to take place on July 14, 2007, tickets sold out within 30 minutes via an exclusive Myspace.com pre-sale. In order to accommodate fans, July 13th was added immediately. In less than 24 hours, the second night was sold out via the same pre-sale, and now the Vermont-formed trio has announced they will play a third night on July 15th. Tickets for July 15th will go on sale to the public on Saturday, January 20th at 9am (Eastern). These dates have already made history, making Dispatch the first independent band to sell out Madison Square Garden. 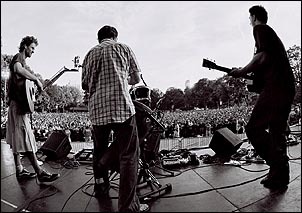 The three members of Dispatch have made a strong impact on the American music industry, releasing 6 albums, including one live album and a live DVD, on their own label and selling more than 600,000 albums, solely based off of incredible word of mouth that was built off of file sharing in the early 90's and active touring. Brad Corrigan, Pete Francis and Chad Urmston became pioneers in the music industry, rising up without the assistance of a major record company. In 2004 Dispatch decided to call it quits and celebrate an amazing eight-year run by performing a free farewell show in Boston, MA. More than 110,000 fans from 25 countries showed up, making it the largest independent music event in history. Now Dispatch is back, coming together for a cause that's greater than anything that drew them apart. All of the proceeds from "Dispatch: Zimbabwe" will go towards fighting disease, famine, and social injustice in Zimbabwe. In an effort to bring the fight to their own country, Dispatch will donate a small portion of the money raised to the domestic causes they have long supported.